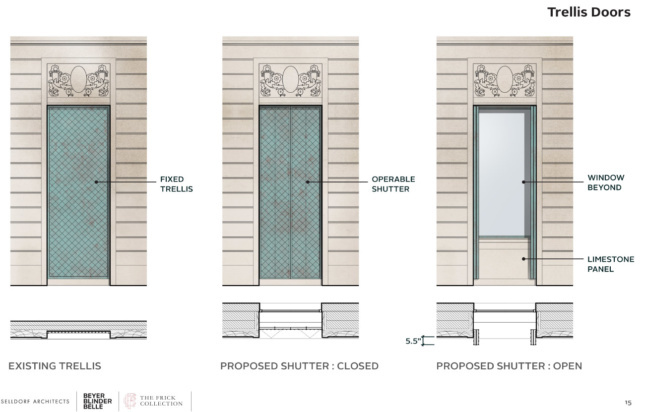 A revised scheme for the Selldorf Architects-designed expansion of Manhattan’s Frick Collection with Beyer Blinder Belle (BBB) acting as executive architects has gained approval from the Landmarks Preservation Commission (LPC). While commissioners voiced their concern over the addition’s fenestration and whether enough was done to move the proposed programming underground, they ultimately voted to approve the presented plan. That approval still faces resistance from local residents and preservationist groups, including an injunction hearing scheduled for this September that could slow the project down further. In approving the expansion, landmarks commissioners noted the support the project had drawn from the public, including from architects, preservationists, art historians, curators, and landscape architects, but acknowledged they had also received emails in opposition as well. 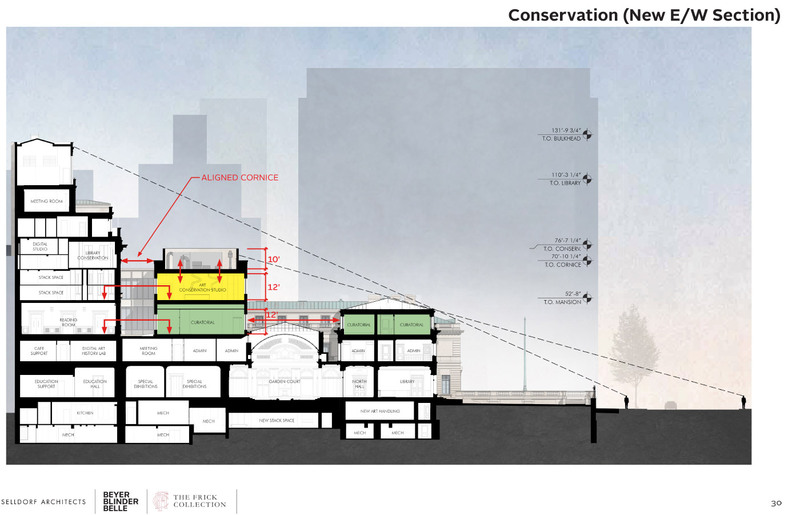 Four grandchildren of Henry Clay Frick have signed letters signaling their support, and the commissioners were quick to mention their prior approval of the more experimental, Jeanne Gang-led expansion at the American Museum of Natural History. The original scheme for the Frick’s latest expansion was presented at a May 29 hearing where the public was invited to openly comment. Selldorf and BBB had proposed increasing the floor area of the Frick by 10 percent­­­­(18,000 square feet) to provide room for new conservation areas, offices, and gallery spaces with 1,800 of that square footage to be placed underground. 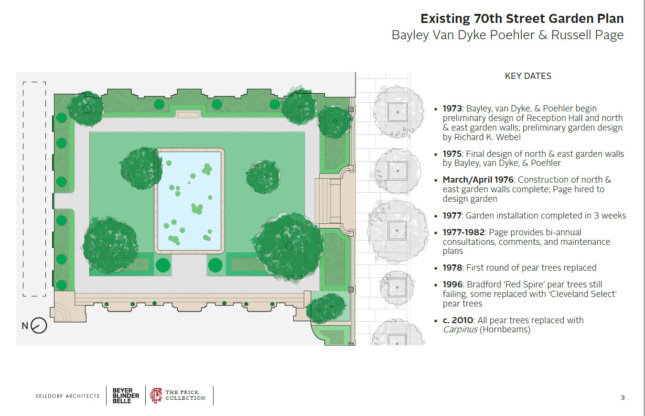 Perhaps the most debated portions of the expansion plan touch on the Russell Page-designed garden on East 70th Street which was added in 1977. Installing the proposed 220-seat auditorium below the garden will require removing the garden above and reinstalling it exactly as it was before. 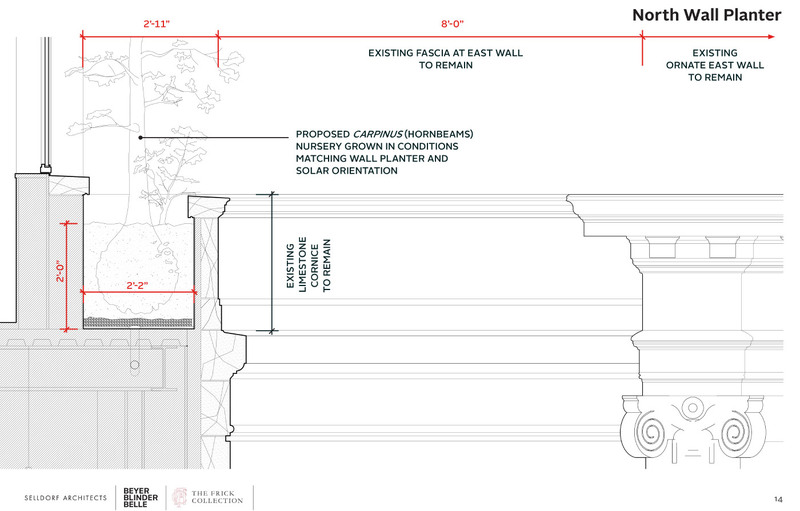 The north wall of the 4,100-square-foot garden, part of the 1977 Bayley, Van Dyke & Poehler addition that originally created the garden, is also on the block to be rebuilt. As the scheme calls for the library to rise directly over the garden’s northern wall, a series of hornbeam trees behind the wall that were planted in 2010 (replacing pear trees placed by Page to mask the back of the existing library building) would need to be removed. The original plan had placed the new library almost flush with the north wall, but the trees were ultimately spared in the final version. Annabelle Selldorf was on hand for the follow-up LPC meeting on June 26 and explained that by setting the addition’s massing back three feet from the north wall’s edge, they were able to carve out a shelf behind the cornice for replacement trees. The smaller hornbeams would be located in the same positions as their predecessors and are intended to recreate the trompe l’oeil, the sense that the garden stretches on past its confines, that the current trees bring to the landscape. Selldorf was adamant that shaving three feet off of the addition was the most that can be done, and that tightening the massing any further was impossible due to programmatic requirements. The circular John Russell Pope-designed Music Room, set to be dismantled to make way for more special exhibition space, was briefly discussed as commissioners prodded the Frick to explain why the space couldn’t be repurposed. Museum representatives explained the difficulty in staging exhibitions inside of a round room and the associated temporary architecture required, and that more space was needed to display their collection. The Music Room’s Versailles-patterned wood floors and non-structural wall panels will be reused in the replacement gallery space, and the entire room will be 3D scanned and included in the Frick’s collection. That is, if the room is actually taken apart. As the commissioners noted during this week’s meeting, an active Request for Evaluation (RFE) to designate the Music Room, West Gallery & Enamels Room, and the 1977 Reception Hall as interior landmarks is currently being processed. Questions were raised over whether approving the expansion would preclude the music room’s designation, but commissioners received clarification that the two items were not in conflict with each other. It was entered into the record that the LPC takes a meticulous approach to interior designations and that if the RFE is approved, the scheme will have to be retooled to include a circular music room. Though the commissioners questioned the design team on whether more of the proposed programming could be moved underground­, the plan presented was approved with six votes for, one against, and one commissioner choosing to abstain. 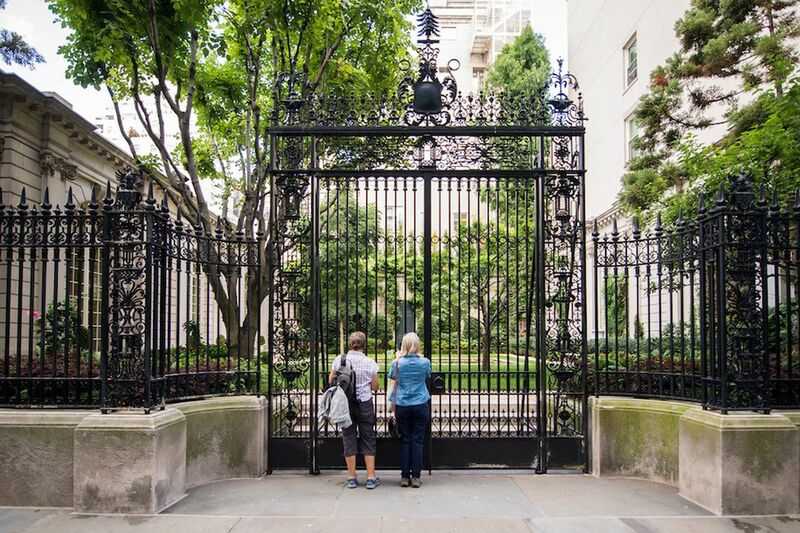 The Frick is an individual landmark within the landmarked Upper East Side Historic District, but commissioners highlighted the fact that the Frick Collection is a campus of separate buildings from many different time periods when making their final decision. Opponents have compiled a laundry list of complaints against the Selldorf and BBB plan. 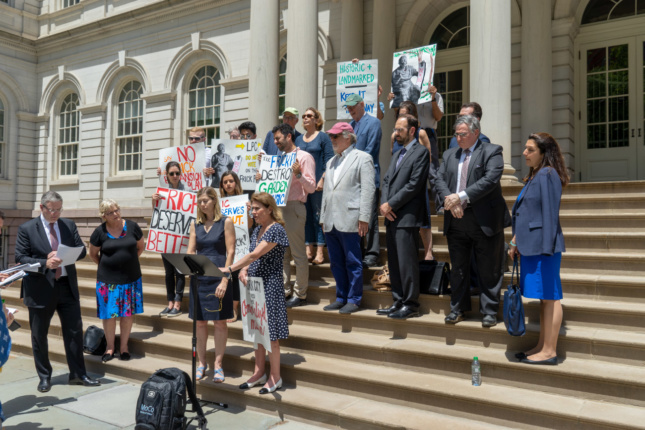 The Stop Irresponsible Frick Development (SIFD) coalition, a collection of architects, preservationists, and activists gathered on the steps of City Hall on June 25 to make their voices heard about why the expansion should be halted. Citing the lack of time given to the public to review the revised scheme, the LPC’s failure to consider landmarking the Music Room first, the potential conflict of interest arising from interim LPC chair and BBB partner Fred Bland’s participation in the process, the necessity of the Frick to expand its collection to such a degree, and the addition of a glassy café topper above the reception hall, the group had tried to delay the June 26 vote. Although an emergency temporary restraining order was submitted by the group on June 25 to the State Supreme Court, the judge decided not to grant the measure. However, an injunction hearing has been scheduled for September, which will force the Frick to defend their decisions in court and risks throwing a wrench in the project’s timeline. Preservationist Theodore Grunewald was responsible for filing the Music Room RFE (at the May 29th hearing itself, a first in the Commission’s history) arguing that the room deserves to be judged on its own merits. This is the first time that an RFE for a separate part of a project has been raised independently before the LPC. In an op-ed published to the New York Times on June 25, Martha Frick Symington Sanger, a great-granddaughter of Henry Clay Frick, laid the groups concerns bare. “Let us engage an independent professional to evaluate the feasibility of excavation for proposed new facilities,” wrote Sanger, although the LPC noted that they have, historically, never taken outside design considerations into account when making their decisions. The full presentation given at the June 26 LPC meeting is available here. According to the Frick, construction on the addition will not begin until 2020. AN will continue to provide updates on this story as they become available.